Lower heating bills and household CO2 emissions with energy efficient frames. Astral’s energy-efficient frames offer high energy ratings using cost-effective glass units. We carry out rigorous testing to pair glass and frame combinations offering A+, A, B and C energy ratings at great value. All our frames are rated in accordance with Kitemark Window Energy Rating Scheme and Energy Saving Trust guidelines and meet the requirements of the A-G energy rating scale. Astral has also been awarded an A+ WER licence for Rehau Total 70c windows. When fitted with the latest triple-glazed insulated glass units they can achieve an industry leading ‘U-value’ of 0.9 w/m2k. 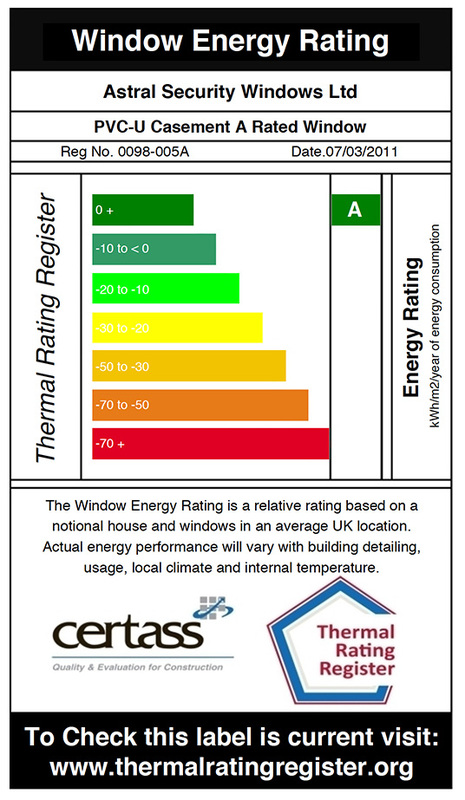 Astral is a proud member of the CERTASS Thermal ratings register. All our products have been independently tested to ensure we fulfil our stated standards.